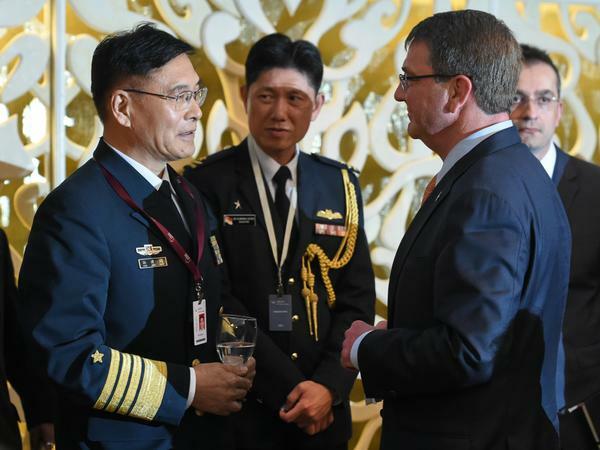 Sun Jianguo (left), from the Chinese People's Liberation Army Navy, chats with U.S. Secretary of Defense Ashton Carter in May during the ministerial luncheon at the 14th Asia Security Summit in Singapore. Each country has grown increasingly wary of the other's actions and interests in the South China Sea. Chinese and American officials are deep into their annual meeting this week in Washington, hashing out the nations' complex relationship. In addition to many economic and strategic issues, they'll discuss China's remarkable island-building in the South China Sea. In just 18 months, China has created more than 2,000 acres of new land where before there were just waves and reef, according to the U.S. Beijing says it's just trying to protect territorial claims in disputed waters, but American officials see a risk to regional stability. Beijing says it has built the islands to catch up with other neighbors, such as Vietnam, which also has done reclamation work — but China's has been on an epic scale, and many observers think future plans could include a naval base. On one reef, known as Fiery Cross, workers are building a runway that could extend to 3,000 meters and handle most military jets. "The purpose is to develop a limited degree of military deterrence — primarily against the United States Navy," says Feng Zhang, who teaches international relations at Australian National University in Canberra. In 2011, the Obama administration pledged to shift more military hardware to Asia in what it then called a "pivot." The idea was to put more emphasis on Asia because of its global economic importance. Naturally, this set off alarm bells in Beijing, which is building up its navy and trying to project power. "What's the target? What's the purpose?" says Xu Qinduo, who has worked for state-run China Radio International and is a visiting scholar at the University of Melbourne. "It's quite clear: It's targeting China!" According to official Chinese rhetoric, the constructed islands are designed to help with safe navigation and search and rescue, but neighbors are deeply suspicious. Last year China placed an oil rig in disputed waters nearer to Vietnam's coast than to China's. That led to clashes between boats from both countries, and to riots in Vietnam. Last month, Filipino fishermen say a Chinese coast guard vessel fired water cannon to drive them away from the traditional fishing grounds of Scarborough Shoal, which China largely took control of in 2012. "We've got a tremendous perception gap going on here between China and its neighbors," says David Finkelstein, who directs the China Studies program at the Center for Naval Analyses, a government-funded think tank in Arlington, Va. "They see a China that's trying to resolve these disputes by force of economic and military muscle — and of course, that's how the U.S. sees this." Until recently China has managed to avoid heavy international criticism as it constructed the Islands. But in May, the U.S. Navy flew a spy plane near an island with a CNN crew aboard. The Chinese warned the plane it was approaching a military zone. "This is the Chinese navy," the spy plane was warned over the radio. "Please go away quickly." Video from the flight, which showed a dredge spewing sand onto an artificial island, drew global attention. U.S. Secretary of Defense Ashton Carter publicly criticized China and called for a halt to reclamation by all countries with competing claims in the South China Sea. Yanmei Xie, a Beijing-based analyst with the International Crisis Group, says China didn't fully anticipate the backlash and was surprised it became an international issue. Xie says advisers may have been reluctant to tell Chinese President Xi Jinping that the tactics were likely to boomerang. "Xi Jinping is considered to be a more nationalist, more ambitious leader with higher risk tolerance," she says. "So everybody tries to provide analysis and policy recommendations based on what they believe the leader wants to hear." Last week, Beijing said it plans to complete some of its reclamation soon. Some observers think U.S. criticism may have contributed to the announcement's timing as well as China's desire for smoother talks this week and a successful summit in September when President Xi meets President Obama in Washington. Robert Griffiths, a former U.S. Consul General in Shanghai who teaches at the National Defense University, says this is a familiar pattern with China. "I think, though, that if you look at Chinese behavior over the past years and decades, you'll see that they sometimes push the envelope and then will pull back," says Griffiths, who emphasized he was not speaking for the U.S. government. "They really don't want to have poor relations with all their neighbors." Nor, for now at least, does China want bad relations with the U.S., most analysts say. There are fears that miscalculation in the air or at sea could lead to conflict, but Finkelstein says officials in Beijing and Washington recognize that the relations between the world's two most powerful countries are too important and complex to allow that to happen. Chinese and American officials are holding an annual meeting this week in Washington, hashing out the two nations' complex relationship. In addition to economic and strategic issues, they will discuss China's remarkable island-building in the South China Sea. In just 18 months, China has created more than 2000 acres of new land, where before there were just waves and reefs. Beijing says it's just trying to protect territorial claims in disputed waters, but America sees a threat to regional stability. NPR's Frank Langfitt reports from Shanghai. FRANK LANGFITT, BYLINE: Beijing says it's built the islands to catch up with other neighbors, such as Vietnam, which has also done reclamation, but China's has been on an epic scale. And Feng Zhang, who teaches international relations at Australian National University, says future plans could include a naval base. FENG ZHANG: The purpose is to develop a limited degree of military deterrence, primarily against the United States Navy. LANGFITT: In 2011, the Obama administration pledged to shift more military hardware to Asia in what it then called a pivot. That set off alarm bells in Beijing. XU QINDUO: So what's the target? What's the purpose? LANGFITT: Xu Qinduo has worked for state-run China Radio International and is a visiting scholar at the University of Melbourne. QINDUO: It's quite clear. It's targeting China. There's a strong, growing suspicion from the Chinese side and the Chinese military - you know, what the U.S. is going to do and what the U.S. can do basically to contain the rise of China. LANGFITT: According to official Chinese rhetoric, the islands are to help safe navigation and search and rescue, but neighbors are deeply suspicious. Last year, China placed an oil rig in disputed waters nearer to Vietnam's coast than to China's. That led to clashes between boats from both countries and riots in Vietnam. David Finkelstein directs the China studies program at the Center for Naval Analysis, a government-funded think tank in Arlington, Va.
DAVID FINKELSTEIN: We've got tremendous perception gap going on here between China and its neighbors. They see a China that's trying to resolve these disputes by force of economic and military muscle. And, of course, that's how the U.S. sees this. LANGFITT: China managed to avoid heavy international criticism as it constructed the islands, until recently, when the U.S. Navy flew a spy plane near an island with a CNN crew aboard. The Chinese warned the plane it was approaching a military zone. UNIDENTIFIED MAN: This is the Chinese Navy. This is the Chinese Navy. Please go away quickly. LANGFITT: U.S. Defense Secretary Ashton Carter publicly criticized China. Yanmei Xie says China didn't fully anticipate the backlash. Xie's a Beijing-based analyst with the International Crisis Group. YANMEI XIE: They expected negative responses, but they were surprised that it could become such a regional issue - it could become such an international issue. LANGFITT: Xie says advisors may have been reluctant to tell Chinese President Xi Jinping that the tactics were likely to boomerang. XIE: Xi Jinping is considered to be a more nationalist, more ambitious leader with higher risk tolerance, so everybody tries to provide analysis and policy recommendations based on what they believe the leader wants to hear. LANGFITT: Last week, Beijing said it plans to complete some of its reclamation soon. Some observers think U.S. criticism may have contributed to the announcement's timing, as well as China's desire for smoother talks this week and a successful summit in September, when President Xi meets President Obama in Washington. Robert Griffiths is a former consul general in Shanghai and teaches at the National Defense University. Making clear he wasn't representing the U.S. government, he offered this. ROBERT GRIFFITHS: I think, though, that if you look at Chinese behavior over the past years and decades, you'll see that they sometimes push the envelope and then will pull back. They really don't want to have poor relations with all their neighbors. LANGFITT: Or for now, at least, with the United States. Frank Langfitt, NPR News, Shanghai. Transcript provided by NPR, Copyright NPR.